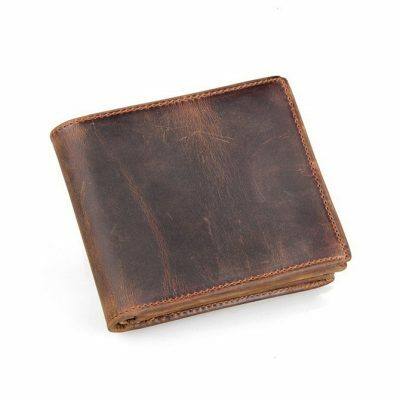 Handmade leather wallet, genuine leather wallet and vintage leather wallet for sale, all our luxury leather wallets are handcrafted by expert artisans. 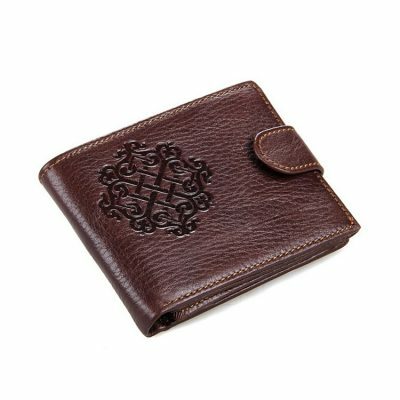 We only offer high-quality and high-end handmade leather wallets to our customers. The main materials we use in all of our handmade leather wallets are high-quality full-grain leather as our leather bags. And like all our luxury leather goods, they are guaranteed for life. To ensure our leather wallets with the best quality and best performance, we arranged some very experienced leather craftsmen in our production line. Hope that every handmade leather wallet can be a beautiful work of art, which can stand the test of time. A leather wallet is a personal thing, as a daily bag that you would often use, plays an important role in our daily life, especially for businessmen. Within a day, you can’t avoid taking your leather wallet out and put it back. 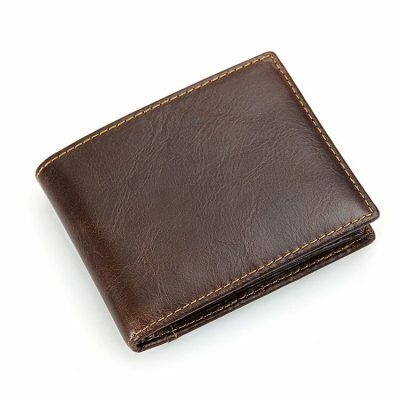 Therefore, it requires that your leather wallet should have a good quality and fashion appearance. Nowadays, leather wallets have many styles and types. Your choice of leather wallet says a lot about you. At VANGOSEDUN Leather, you will find the classic, stylish, elegant, noble handmade leather wallets, The leather we use is from cowhide, crocodile, alligator, which most imported from Italy and Thailand(crocodile), Italian leather is a durable and well-made material; leather dyes, surface treatment, and threads are from Germany and Japan; hardware is from American and Taiwan; committed to quality and individuality, every leather wallet is handcrafted to tough specifications. As our leather materials are more durable and longer lasting than other wallet materials. We can guarantee that our handmade leather wallets will provide you with the quality and craftsmanship you expect. 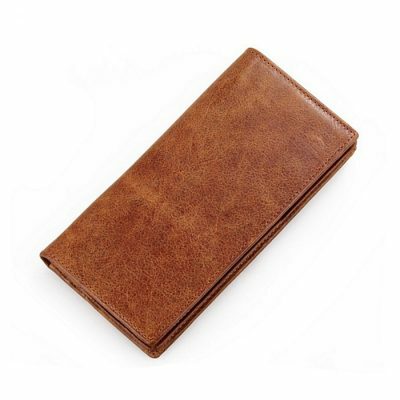 Whether long men’s leather wallet, or short men’s leather wallet, both of them will be very convenient for you. The choice is yours. If you want a leather wallet that makes you look fashion and tasteful, VANGOSEDUN men’s leather long wallet will be better. If you want a leather wallet that is convenient for you to carry, VANGOSEDUN men’s short leather wallet will be the good one. Both of them will show you wise and efficient image! 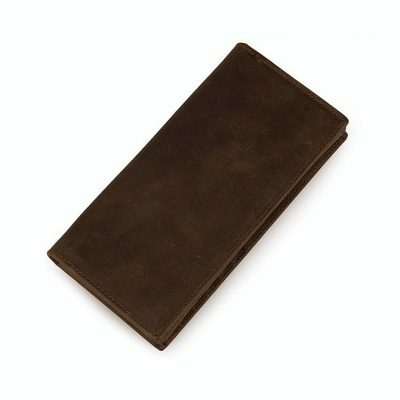 Known for its high quality and durability, leather wallets are often purchased and used by customers. Leather wallets have stylish look and possess a large variety to choose from. 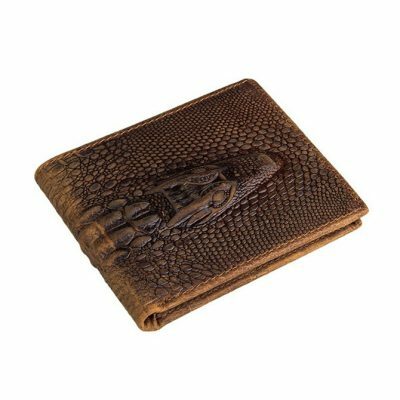 Whether it is crocodile or alligator skin, leather wallets offer you style and satisfaction. Customers who want to purchase certified and quality made wallets has the best choice in leather wallets. With its large variety, colors such as brown or black are the best colors to choose. Combining flexibility and style, leather wallets are not only handy but also everlasting. Other wallets could not offer you that but leather wallets sure can! 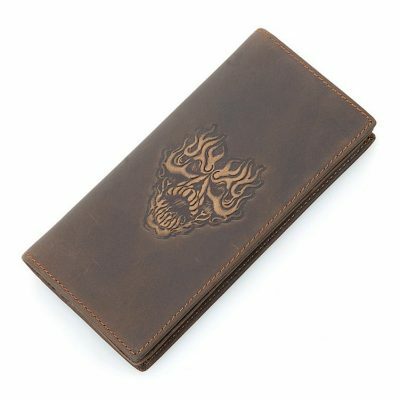 If you are interested in buying a leather wallet, there are important things you need to consider. 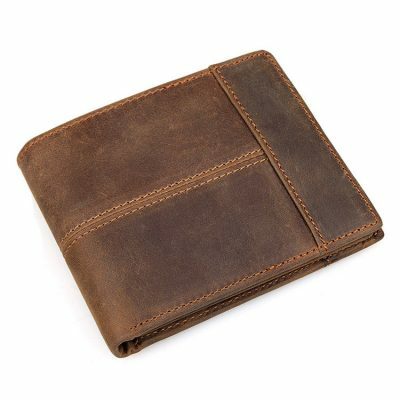 Leather Material: Shopping at an online store offers you a large selection of wallets. Don’t be attracted by the sizes or even the brands. As a wise buyer, you need to know the materials used in the wallet. Most wallet manufacturers use cow leather as the material for their wallets. However, you can also choose from crocodile leather, alligator leather, sheepskin leather or snakeskin leather and many more. For durability and stronger quality, choose a crocodile leather. Aside from the durable features, you could also be fashionable with the many designs it has on the market. Rest assured you have a great wallet to choose or purchase as a gift. Wallet Price: Leather wallets could be bought at different prices depending on the type of materials used in Snakeskin leather has a lower price compared to crocodile leather. 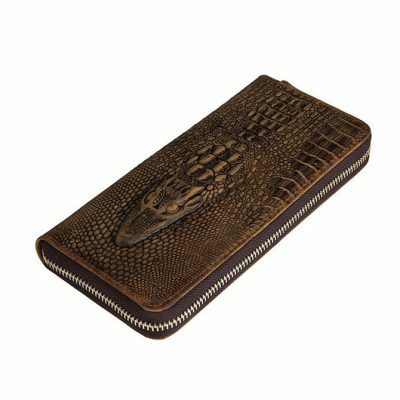 Due to the durability and lifetime guarantee, you could expect a high price for a crocodile or an alligator leather wallet. Make a wise purchase by settling on the wallet that fits your budget. You could go the expensive types but make sure you have extra cash left when you get home. Quality and Durability: Leather is known to be durable but if you are looking for a worthy purchase, the crocodile leather is the best wallet to choose when it comes to quality and durability. With the crafty design and authentic colors, the best selection of crocodile leather wallet is given to you. For consumers who are planning to order these wallets on fashion stores as a gift, you have a greater selection of wallets you need. Hence, no worries when it comes to the lasting quality. Comfort and Convenience: There are many designs of leather wallets found on the market. With these designs, you could choose the best features that fit your convenience. You could have a leather wallet that has pockets for cash and the other side for credit cards and accessories, In addition, purchase a leather wallet that is a perfect fit for trench coat or breast pocket. Purchasing leather wallets takes a little decision making to ensure you purchase the right kind that suits your satisfaction and use. The quality and materials are excellent and worthy of your money. Therefore, don’t settle for anything. Leather wallets are the best buy you have on the market today! 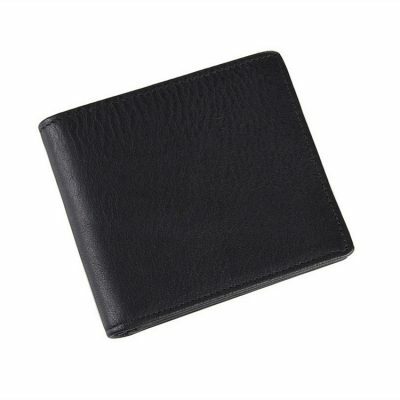 Men’s leather wallets come in different styles to hold various items needed throughout the day. Some men prefer leather wallets that can hold more cash, while others prefer that their leather wallets provide easy access to credit cards fit into slots. Other styles are a better fit for the back pocket, while some are slimmer and tailor-made for the breast pocket of a trench coat. 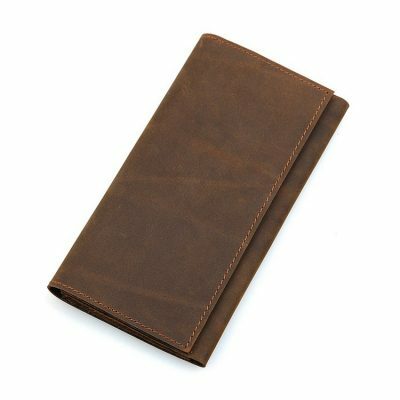 Bi-Fold Leather Wallet: The bi-fold leather wallet is the most common type of wallet available. It is designed to carry banknotes and credit cards. The banknotes are inserted unfolded into the top opening, and credit cards are inserted either horizontally or vertically. The wallet is then folded in half. 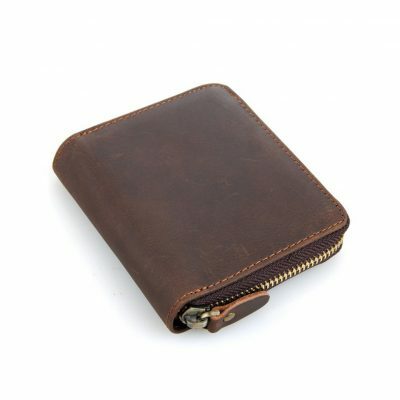 Many bi-fold wallets do not feature a coin pocket, although some styles do feature a small zip or press-stud closure pocket that can hold a small number of coins. Bi-fold leather wallets are practical to carry in a pants pocket as they lay relatively flat. Tri-Fold Leather Wallet: The tri-fold leather wallet looks like a tri-fold brochure, with two sides that open out from the center of the wallet. The card slots sit vertically inside the wallet. The main part of the wallet is a pocket to hold paper money. There may also be a card slot with clear plastic to hold a driver’s license or identification card. These wallets may also feature a zippered pocket for extra change. They tend to be bulkier than the bi-fold wallet, but still easy to carry. Travel Leather Wallet: The travel leather wallet is designed to hold all important travel documents, including passport, airline tickets and itinerary, hotel booking documents, traveler cheques and foreign currency, as well as credit cards and identification cards. 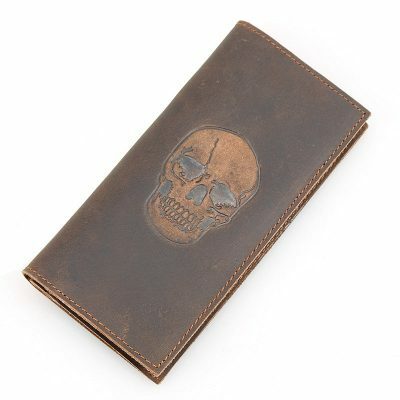 As its name suggests, this type of leather wallet is designed specifically for travelers. A travel wallet generally features a zip closure or press-stud closure of some sort in order to keep all documents secure. Checkbook Leather Wallet: The checkbook leather wallet sometimes referred to as a breast leather wallet or a secretary leather wallet, these wallets are long and slim. They fit into the front pocket of a jacket or trench coat. 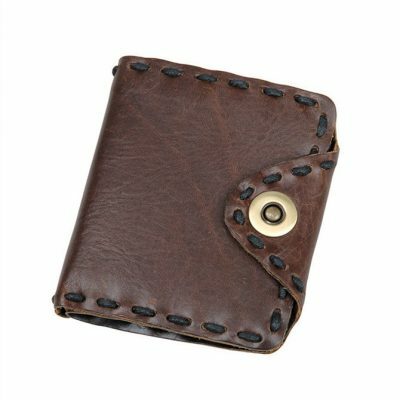 These wallets for men contain several slots for cards, a pocket to hold money without having to fold the bills, and a place to keep a checkbook. 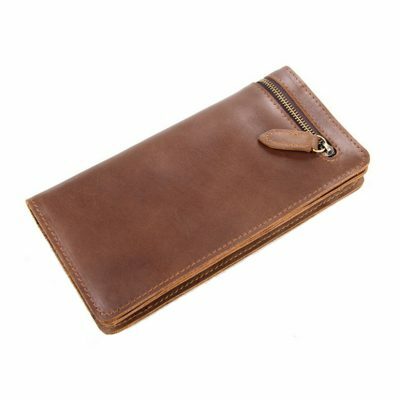 Long Leather Wallet: A long wallet is about the same size as a checkbook leather wallet and holds bills flat without folding them. 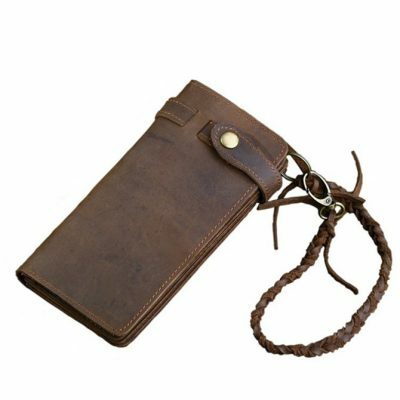 This type of wallet usually features a chain to secure the wallet to a belt loop or clip onto a pair of jeans or trousers. These wallets can also be held in a large back pocket or a front pocket of cargo pants. Tags: handmade leather wallet, genuine leather wallet, leather wallet, handmade leather wallets, luxury leather wallet, slim wallets, handmade wallets, men’s leather wallets, leather travel wallets, black leather wallet, brown leather wallet, vintage leather wallet, best leather wallet, leather card wallet, handmade leather wallets online.